Sir William Penn (23 April 1621 – 16 September 1670) was an English admiral and politician who sat in the House of Commons from 1660 to 1670. He was the father of William Penn, founder of the Province of Pennsylvania. Penn was born in St. Thomas Parish, Bristol to Giles Penn and Joan Gilbert. He served his apprenticeship at sea with his father. In the First Anglo-Dutch War (1652–1654), he served in the navy of the Commonwealth of England, commanding squadrons at the battles of the Kentish Knock (1652), Portland, the Gabbard and Scheveningen (1653). In this last battle, a sniper from his ship killed Dutch admiral and fleetcommander Maarten Tromp on the Dutch flagship Brederode. In 1661, Penn was re-elected as a member for Weymouth and Melcombe Regis in the Cavalier Parliament. In the Second Anglo-Dutch War, he was flag captain at the Battle of Lowestoft (1665), serving under James, Duke of York, and later in the same year was admiral of one of the fleets sent to intercept Ruyter. A key source for the adult life of Penn is the Diary of his next door neighbour Samuel Pepys. In 1660, Penn was appointed a Commissioner of the Navy Board where he worked with Pepys, Clerk of the Acts to the Navy Board. The character of "mean fellow", or "false knave",  given him by Pepys is borne out by much that is otherwise known of him. But it is no less certain that he was an excellent seaman and a good fighter. 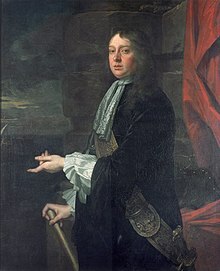 Like Pepys and the Earl of Sandwich (Pepys' patron at the Navy Board) Penn was a "moderate" Roundhead who had succeeded in maintaining his position at the Restoration. Unsurprisingly, Penn appears several times in Pepys diary. A typical entry (5 April 1666) reads "To the office, where the falsenesse and impertinencies of Sir W. Pen would make a man mad to think of." But he is referenced perhaps most vividly in an entry for 1665, which states: "At night home and up to the leads [roof], were contrary to expectation driven down again with a stinke by Sir W. Pen's shying of a shitten pot in their house of office". On the other hand, the diary entry for 4 July 1666 contains a long account of Penn's analysis of what was to be learnt from the Four Days' Battle, ending with the statement: "He did talk very rationally to me, insomuch that I took more pleasure this night in hearing him discourse then I ever did in my life in anything that he said." 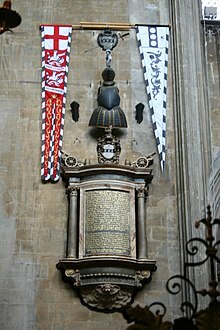 As a native of the West Country, Sir William Penn is buried in the church of St. Mary Redcliffe in Bristol. His helm and half-armour are hung on the wall, together with the tattered banners of Dutch ships that he captured in battle. His portrait by Lely, part of the Flagmen of Lowestoft series, is in the Painted Hall at Greenwich. After his death, his son, William, accepted the grant of land in the American colonies in lieu of money owed by the Crown to his father, and he named the new colony Pennsylvania in his father's memory. ^ Jenkins 1896, p. 14. ^ a b c d e f g h Hannay 1911, p. 99. ^ a b Ferris 1983. ^ Shaw 1906, p. 224. Wikisource has the text of the 1885–1900 Dictionary of National Biography's article about Penn, William (1621-1670).